This excellent feature has now got even better! You can choose to add a column then choose Column From Examples to base it on your currently selected columns. The first few rows are shown - notice that they were all for purchases made in December. Here we've typed in the month name corresponding to the first listed date, which is enough for Power BI Desktop to guess our intentions. 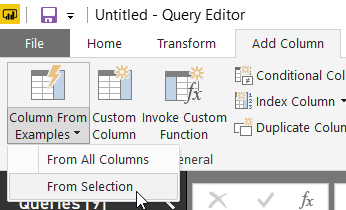 Once you're happy Power BI Desktop has got it right, you can choose to keep or discard your new column. So that's how this feature works. What's new? Note that there is no rhyme or reason to the abbreviations we've chosen, so we have to type in each one. You can double-click on the column you've created to see the underlying formula. The column specifies that if the value of the centre type name is Factory Outlet, it will display FO; if it's Retail Park, it will display R Park; and so on for the other centre names. 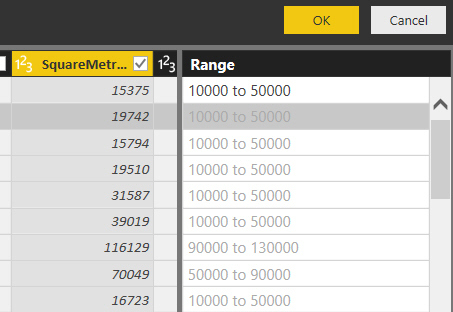 When you type 10000 to 50000 for the first shopping centre's square metres area, Power BI Desktop assigns it to a band and guesses all of the other ones. 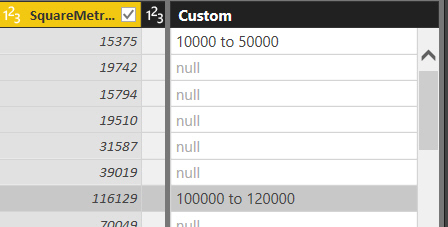 If you type in another band, Power BI Desktop gets lost and reassigns all of the other numbers to null. There are a few more new things you can do with column by example, but the above should be enough to let you decide for yourself whether this will be useful in your work.